Shanghai parish in Les Cayes. 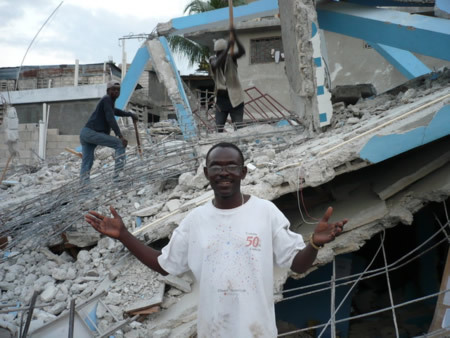 The Haitian Orthodox mission became widely known only after the devastating earthquake in January of this year. Haiti is not only the poorest country in the Western hemisphere and but also in the world. About nine million people live in this Caribbean island nation. Some 3000 of them are members of five ROCOR parishes led by two priests: Fr. Gregoire Legoute and Fr. Jean Chenier-Dumais. Miloserdie.ru asked the Executive Director of the Fund for Assistance to ROCOR and Development Manager Alena Plavsic how the mission is being helped after the quake, and how Orthodoxy came to be in Haiti. Right after the earthquake Deacon Matthew Williams, (he was ordained to the priesthood on Feb. 20th) the former administrator of the mission, travelled to Haiti and disbursed the first aid of $30,000. To date the FFA has raised over $170,000. The mission also lost its only car. “We want to buy them a car first and foremost, because the priests need to visit parishes all over the country,” said Fr. Victor Potapov. Most of the population in Haiti– 80% - are Catholics, 16% are Protestant, 3% practice other religions, 1% are atheists. At the same time about half of the population practices voodoo. Their choice of religion goes back to the history of the country. In 1492 Spain discovered the island and named it Espagnola and started colonize. In 1677 the Western part of the island was taken over by France, while the central and Eastern part of the island, called Santo Domingo continued to be under Spain. Most of the local population became extinct, and their place was taken by African slaves. of the ruins of his school. How did Orthodoxy came to be practiced in Haiti? Fr. Victor Potapov: “About 20 years ago Anglican priest Michael Graves converted to Orthodoxy and started missionary efforts among the Haitians. They came to ROCOR, because Russian Orthodoxy felt more akin to them than Greek Orthodoxy. They really like Russian Orthodox Church music, and such saints as St. Seraphim of Sarov, and the elders of Optina. Fr. Jean Chenier-Dumais in front of the ruins of his school. After the Reunification with the Moscow Patriarchate the mission administrator in Haiti, Fr. Gregory Williams went into schism and tried to take the mission with him. But Fr. Gregoire and Fr. Jean knew the situation in the Church and refused to follow him. Most members of the mission remained with ROCOR. A few months ago I asked Fr. Gregoire why they didn’t follow Fr. Gregory (their life would have been easier if they had, because Fr. Gregory was in control of the mission’s finances). He said: “We understand Orthodox Ecclesiology, we know that schism is worse than heresy (quoting St. John Chrysostom), and we didn’t want to hurt the Body of Christ. Church is now paying more attention to them, even though it took such a tragedy for the world to notice. Nobody thought about them much before the earthquake. We hope that with the help of our Orthodox brethren, we will be able to assist and strengthen the mission. MP churches in Portugal, France, and Germany sent us money for them. Many Russian citizens wanted to send us money, but were prevented by some sort of bank rules. We were not ready for this, we don’t have a bank account in Russia to allow Russians to donate. Some people still managed to send us money. 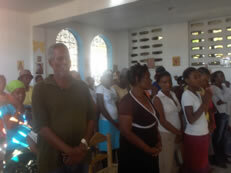 We hope that Haiti will have more priests in the future to tend to the flock as the mission grows.